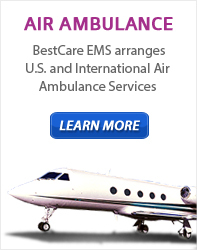 BestCare EMS – Ambulance & Air | What precautions do you take when transporting Children & Child Patients? Approximately 6 million children are transported by emergency medical services (EMS) vehicles each year in the United States. An ambulance is NOT a standard passenger vehicle. BestCare implements and follows guidelines & research provided by The Emergency Medical Services for Children (EMSC) Program and the National Highway Traffic Safety Administration’s (NHTSA) to improve the safety of pediatric patients being transported in EMS vehicles. Importantly, as is mandated in several states, the NHTSA Emergency Vehicle Operating Course (EVOC) National Standard Curriculum, or its equivalent, is an integral part of BestCare’s transport safety enhancement. Drive cautiously at safe speeds observing traffic laws. Tightly secure all monitoring devices and other equipment. Ensure available restraint systems are used by EMTs, to secure the safety of patients, parents, children, caregivers and other occupants. Transport accompanying non-patient children in a proper restrained alternate passenger vehicle, whenever possible.